The final post of 2012 🙂 I hope everyone had a safe and happy holiday. With 2013 just around the corner, I thought I would provide an update to this weeks work but also as to what I hope 2013 holds for this project as well. It has been a very exciting project, that has taken a lot of time and I enjoyed every minute of it. Last week, I started laying down some base colors on the existing artwork that I have inked. In that regard I am on page 4 of 7. Each of those pieces still need to have highlights and shading added to them. There are a little over 20 drawings in that group. I have continued to ink images as well, I am on page 5 of 7. I am looking at probably another month until the final shot is fully inked, colored and shaded. I have also continued to work on the trailer. I have re-rendered out some previous shots with a new color scheme and also created a new scene. These shots all need to be composited but I can start working on the remaining shots and as those render, I can work on compositing. As I look ahead to 2013, I have several things I am going to work hard to complete. In terms of Cosmic Rage, I am hoping to have the trailer done sometime in the first quarter of 2013. As work continues on the trailer, there is more work being done on the episode as well. I believe January will be used for finishing the trailer and also the coloring process for the final shot. I think sometime in February compositing on the trailer and more animation on the episode will start. Early 2013 I also want to complete a couple other projects. I have kept them a little bit under wraps. One of the projects we have received some user feedback and are working to resolve those. The first quarter of 2013 should see the release of a few of these projects and I look forward to sharing these once they are completed. I look forward to seeing you in 2013! Happy holidays everyone 🙂 I hope you are enjoying your holiday. I have some traveling to do for the holiday and also finished up a freelance project last week as well. This week in terms of the trailer, I am currently rendering out the last batch of frames for the final shot in the current batch I am working on. I need to revisit a previous shot to modify the coloring. I don’t anticipate a long render on that shot. I do have some 3D work for another project coming up as well. As for inking and painting the final scene of episode one, I am now on page 4 of 7. I am hoping to start getting some painting done this week as well. Not sure how much inking will get done with the traveling, but I built up enough inked works to have things to paint. Finally, I have a few other projects that should be wrapping up in early 2013. After hitting a couple snags on 2 of them, one of them should be completed in January or early Feb. I would like to get the other completed then too, however I am not 100% sure on how some of it will go. Once these are out I will be sure to showcase them here as well. With the holiday and traveling I won’t be posting on Thursday but next week will bring another Production Update. Have a safe holiday break. During last weeks blizzard I was also able to get through the recent release of the final act part 1 of Inu Yasha. For those of you who aren’t familiar with Inu Yasha, it started as a manga series by Rumiko Takahashi. It was so popular that an anime series was created as well. However, the production of the anime series eventually caught up to the manga and production ceased. Without an ending to the story, they couldn’t complete the series. The manga eventually ended and production started up again to finish off the series. After several years we now have the first part of the ending to the epic series (it spans over 7 seasons). I recall buying season 7 when I was in college, so it has been a good 4 year gap in production at least, but, that is exactly what I want to write about. Last week I wrote about the increased production value in a series called Initial D over the span of the four seasons that have been out so far and at the start of the CGI movement in Japan. I won’t spoil anything in Inu Yasha so have no fear, I strictly want to discuss some of the interesting things I found in the production gap. First off, you will notice the brighter coloration of the characters. This is because the previous season of Inu Yasha were done with traditional cel style animation. 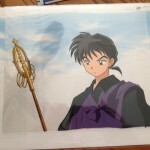 If you seen some of my Japan pictures you can see that I actually picked up a few cels when I was in Japan. The reason for this brightness in the color is because the new season is digitally painted, and digitally painting and compositing allow you to reach colors that traditional cel animation and paints couldn’t. If you want to see a true range of effects you can reach with digital painting I would recommend RedLine. To give you an idea of what the first season’s coloring looked like, here is the opening to the first season. Here is a trailer for the Final Act part 1. As you can see the colors appear brighter than the previous opening. Also note the glows on some of the shots, lens flares and particle effect as well. There are even clips of 3D objects in the trailer that are used through out the series as well that weren’t in the first several seasons. Inu Yasha also used more special effects for different dimensions, transitions between dimensions and even some character attacks. These added effects add an extra level of production quality. The effects look crisp and well polished. Some of the effects when done in previous seasons were simply background paintings, but by using CGI for these they can add very nice secondary effects. If you want to really see how much CGI has evolved in not only Inu Yasha but anime in general, Adult Swim on cartoon network is actually showing the first season on Inu Yasha again and it is also showing Samurai 7 which was a transitional title between cel and digital. These two shows will give you an idea of what to look for before you watch Inu Yasha the Final Act part 1.To my knowledge the same voice actors dubbed this season too so there isn’t any new voices taking over for familiar faces. I have continued to notice that backgrounds and special effects continue to dominate the use of CGI and not many characters are animated using CGI, they still remain hand drawn. I am very interested to see if this trend continues. I have only been able to watch the season one time through so far, I usually try to enjoy the story the first time around and then in other viewings I really start to dissect things. I am sure this won’t be the last I mention this season and I look forward to seeing the second part of the final act next year. Next week will bring another production update. Stay tuned, exciting things coming. Another Monday, another production update to the Cosmic Rage project. First off, with the trailer, I have fleshed out a rough draft of a section and I am working on rendering. Some of the scenes require extra render time because of anti-aliasing. If I increase the anti-aliasing, I will get smoother areas in shadows and reflections. If anti-aliasing isn’t adjusted then in areas (in this case shadows and reflections) they will appear noisy. It appears as if there are pixels fighting for the same area, thats what gives it the appearance of noise. It’s highly distracting so the extra render time is worth it in this case. In this section of the trailer I have 3 shots, one is done rendering, one more should finish today and I have one more to complete that section. The shots do still need to be composited but I will have the 3D renders done and I can start towards more shots in the trailer. On Thursday I will be writing about another recent viewing, this one will be on Inu Yasha the Final Act. In the world of creating content, you can not constantly create, there must be a time where you unwind and take new content in. It is within this time, that more ideas, inspiration and more start to plant the seeds in one’s mind. Having said that, I want to start sharing some of the things I watch and some of the ideas and inspiration that I get from them and how they may shape the future of the Cosmic Rage project. A few months ago, at the SGMS conference, I gave a presentation on the history and some of the techniques of CGI in Japanese animation. In the late 1990’s there were a few titles that were experimenting with CGI. One of the series I discussed was a show called Blue Sub Number 6. One of the series I wanted to talk about but had to cut out due to time, was a show called Initial D.
A friend of my suggested Initial D a while back and I was pretty late in getting to watch it. This past weekend, with the blizzard I had a chance to watch Season 2 (Stage 2) and also a couple of bonus episodes and the movie that is considered Stage 3. Initial D is a story about a high schooler who works at a car shop and also delivers tofu, but starts to become a street racer. The story follows the typical power creep storyline, where the main character overcomes villains who consistently become stronger and harder to beat. The true gem about Initial D is truly the innovative artwork that went into the series. Initial D used 3D CGI for all of the car racing scenes while maintaining the cel style artwork for the character scenes. In the first stage, A scene was generally done either in 3D CGI or cel art, there wasn’t really any compositing or the merging of cel art with 3D CGI. In the second stage there was more compositing of 2D and 3D artwork. When I was learning about the production of Initial D, I learned that after stage 1 did so well, they had a larger budget for the second stage. Also take into account of the growth of technology and software, and stage 2 has a more polished look. The artwork for the Stage 3 movie builds on the stage 2 series. Here is a trailer for stage 2, as you can see, there are a few shots where you can clearly see car renderings in 3D composited with the 2D characters. Finally, here is a trailer for the 3rd stage film. You can see from the first to the third stage, there is a progression in the art. If you have the chance to watch a few episodes I would highly suggest it just from a production stand point. After all of this, you may be asking how this pertains to the Cosmic Rage project. Well, Cosmic Rage is going to feature 2D characters, and I am experimenting with using 3D environments. I want to combine my experiences with drawing, animation, design and motion graphics to create something new. That is what series such as Blue Sub Number 6 and Initial D did when computer animation started to surface in Japan. Its production update time. This week has been a pretty eventful and busy week. I had an immediate project fall into my lap so I have been busy working on those 2 projects this week. having said that I did get some work done early this week that will get expanded upon later this coming week. I got all of the final scene of the first episode scanned into the computer for digital inking, coloring and shading. That will be something I aim to get working on this week. I was also able to get some 3D modeling and animation done on the next shot for the trailer. I need to take a look at it and see if it is ready to be set up to render at some point in the near future as well. I am hoping that it can render in the background and not effect me inking other works. There was the first blizzard of winter this week too, so I have been staying at a friends place with limited working space. I did get some rough drawings for episode 2 started since my computer has been tied down with renders. I got a little work in on a couple side projects but not really enough noteworthy stuff. However one of those projects should be completed towards the end of the year, so big news on that front should be coming soon. My apologies for being a day late again. I have a couple freelance projects that bottlenecked a bit, I am actually blogging while waiting for a render to finish up. An article I read last week from a friend actually inspired me to write one last entry about my trip to Japan, which seems long time ago already. Blogging about the trip and looking at pictures to post has really been a fun way to look back on my trip, I would strongly recommend it to anyone. Clearly, I would strongly recommend a trip to Japan as well as going through the agency I did. I basically wanted to run down some of my favorite things, favorite foods, best experiences as well as share some pics of the haul of goodies I brought home and more. Since there may be some foodies out there, lets go over that first. My friend and I had the intention of finding fugu, or pufferfish. Pufferfish is poisonous and will kill the consumer if the chef fails to prepare the food correctly. There are next to zero deaths a year of consumers dying from prepared food, most deaths come from fisherman that eat the fish in the wild. During all of our adventures we seemingly pushed this endeavor back each day until we basically ran out of time. This is on the list of things to do on our next trip. My favorite food came from a ramen shop and the takoyaki from the street vendors. I would have to wayward an honorable mention to the squid I ate from a vendor as well, I am a little disappointed I didn’t get a chance to eat octopus. Again, next time. Japan has a lot of lemon flavored drinks, which I miss greatly. A specific drink was CC Lemon, I have been looking for somewhere to get it from in the states, but to no success yet. It will only be a matter of time. My favorite place that we visited would have to be the Ghibli museum. As an animator, it was the closest thing to heaven I could have imagined. I wish I could have taken pictures inside to post, but I settled for a book with pictures of the inside. If you haven’t seen any of the Studio Ghibli films, I strongly suggest you give a couple of them a chance. If you ever visit Japan, this is a must see site. They even show short films that you can only see at the museum. This was also the first trip I was able to see the ocean. Some of the funnest moments I had was around the ocean. On one occasion I went seashell hunting and found some shells to take back to give to my sister. My second ocean experience was when we were in the country and we had a group of locals want their pictures taken with us. The people in the country were extremely nice, especially at the festival events. My favorite experience was climbing Mt Fuji at night and witnessing the cities at the foot of the mountain’s fireworks. As I stated in a previous entry, climbing Fuji was one of the most mentally demanding things I have ever done, but it is also one of my proudest moments. I would like to climb the mountain again. Probably the most unexpected awesome experience was the ryokan. I had no idea what to expect but I was pleasantly surprised. The breakfasts were amazing, we walked around in yukatas the majority of the time we were there, the hot spring was amazing and the customer service set a new standard. When I go back to Japan, staying at a ryokan is on the top of my list. The arcades in Akihabara were super fun, you would be surprised at how far you can get in a game just based of user interface design and game animation without understanding the language. The card reader games blew my mind. Shibuya had some musicians playing, I would like to return and go listen to some music some night. Theres something very cool about walking down the street and seeing various musical acts and being able to stop and listen at will. I had a pretty good toy and book haul on the trip. I ended up with a book about the art of Princess Mononoke and also a picture book about the Ghibli museum. I also ended up with 3 production art books from the series Neon Genesis Evangelion as well as some Asuka chopsticks that I eat my cup noodles with. 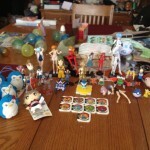 I picked up a giant list of gachapons, from various stores in various areas. The coolest was a store that you could actually trade your gachapons in to and buy other people’s trade ins and complete your collection. 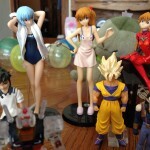 My favorite toys were small figures from Neon Genesis Evangelion I picked up in sealed mystery boxes. While in Japan, I wanted to pick up some anime cels. In early 2000 animation went into the digital realm, which meant that cels were no longer being used to make animation. For example, you can not find cels of newer series, you can only get them of older series. 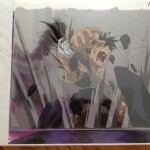 Studios sold cels to fans as a way to make money and provide fans with content that they didn’t have much of a use for. At the cel shop, I could’t read any of the names of the binders of series he had. I did stumble across some binders of Inu Yasha and bought 3 cels. 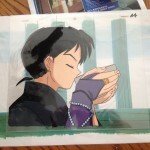 2 of one of my favorite characters, Miroku and also a cool cel of Koga from the same series. I found some binders of Dragonball Z, but most of the cels were missing backgrounds and I want my cels to have background art. On my next trip, I plan on taking more money to get more cels. It was cool when we found a small gallery displaying cels and art of Rouroni Kenshin. As for me, I would like to return to Japan again. I am targeting the spring of 2014 for the spring festivals as my next trip. Hopefully the stars align and I am able to get the trip lined up. If you get the chance or are looking for a trip, I highly suggest Japan! Its that time of the week again for an update regarding the progress we have made over the last week on our Cosmic Rage project. The week has been spent cranking out some of the final artwork for a side project that we are aiming to have out by the end of the year or early 2013. More to come on this project later this month. I have also been finishing up some loose ends on some freelance work. In terms of Cosmic Rage, I was able to re-render two of the previous shots for the trailer. I have worked on another shot that I am aiming to have rendered out this week and start on the next. The trailer will require some drawing, but I am working on getting most of the animation done at this time. There isn’t a lot of drawing for the trailer, I would estimate in the area of around 5-10. I have also ordered some stock footage from Video Copilot if you are an animator/ artist as well. (He currently has a 25% off sale). Those will be arriving and will be used in the trailer. The effects are used for compositing. I will be sure to keep everyone up to speed on that process as it starts. I have also began preparations for the second episode. I figured that there are 95 drawings that make up the second episode, so about the same amount as episode one. Depending on my freelance work this week, I would like to start roughing out some drawings for episode two. However, my priority list is 1) the trailer, 2) inking and coloring the final scene of episode one and 3) roughing out episode two. Stay Tuned for more updates. 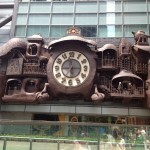 As for Thursdays entry, I decided that I am going to do a final recap of my trip to Japan. Our final day in Japan was a little bit of a lazy day. We hadn’t really had anything planned except for hitting up a few areas that we wanted to revisit. For the duration of our trip, we constantly saw signs pointing to a Pokemon Center nearby at the train station we used daily. We decided that we would check it out. We sadly discovered that it was basically just a store with a ton of Pokemon gear. We thought it was going to have a different layout than just being a store. When we went to the Evangelion store earlier in the week we picked up a magazine that had other Evangelion sites we could visit and get stamps at. 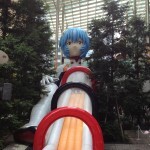 We didn’t do the stamp collecting but we did go check out a giant slide of one of the main characters, Rei Ayanami. We also stopped at the Evangelion store by the slide but it was a rather small one that had mostly the same content as the other store we went to. By the Ayanami slide, there was other stuff advertising for various series, old and new alike. In this area there was a giant steampunk clock. We headed back to Akihabara for some ramen and we also went to spend the last of our loose coins. When exchanging Yen back in the states, they only take the paper bills. So we had 500 and 100 Yen coins we decided to deposit at the arcade. It was the cool seeing Neon Genesis Evangelion posters, billboards and such being advertised everywhere. We even found people sized figures of Asuka and Rei at arcades as well. We made our way back to the area of Tokyo that we were staying at. 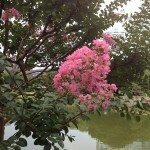 We decided to go to the park that we saw when we first arrived in Tokyo. The park was very large and it was smack in the middle of the city. There were ponds of koi fish, turtles, and lots of flowers. We found one turtle that was swimming and as we watched him he made his way towards us and actually got out of the water and walked up to us. We would hold our hand out and it would try to touch it with his nose. I haven’t seen anything like that before. 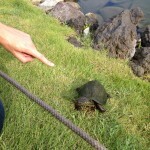 We took some really good videos of the turtle before he worked his way back into the water. *(First image is of the Rei Ayanami slide, next is the giant steampunk clock, the third is of a curious turtle that came out of the water to greet us, finally a close up of some flowers).